This is my dessert version of the cocktail frosé. It is the perfect spring cocktail and this dessert combines those sweet and floral spring flavors. 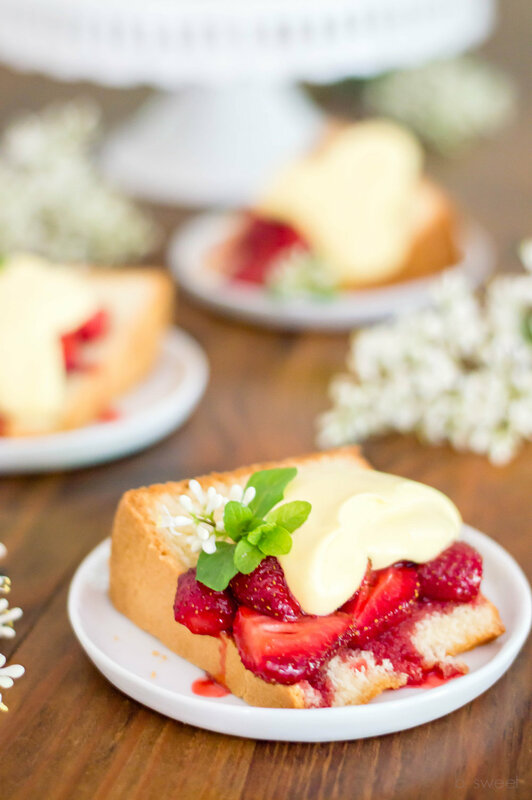 Dense pound cake is topped with sweet strawberries roasted with elderflower liquor and topped with a rich velvety rosé wine sabayon. If you are looking for an easy dessert for entertaining this spring. This dessert will not disappoint. The pound cake and sabayon can be made in advance. Then, all that is left is roasting the strawberries. I like to serve them over the pound cake while they are still a little warm. The syrup from the strawberries will soak into the cake. Top it all off with the sabayon for an impressive easy dessert. Cold oven means no preheating the oven. The batter and the oven both start cold and heat up at the same time. This gentle baking allows for a great texture and crust on your pound cake. I have found that this baking method helps insure a perfect bake. One common problems that happen in pound cakes is sad streaks. The gummy "sad streaks" are caused by over developed gluten that allows for a quick rise but then collapses when removed from the oven. To prevent the gluten from over developing only gently mix after the flour is added. The cold oven method also seems to cut down on this problem. When I picked up some fresh local strawberries, I knew I wanted to try roasting them. Roasting the strawberries brings out all the sweet floral notes. Then, adding elderflower liquor brings these berries to the next level. I definitely recommend investing in a good elderflower liquor like St. Germain. It is a great addition to any cocktail. If you don't have some, adding a little vanilla extract will help round out the strawberry flavor. The best part of roasting your strawberries is that even not so ripe out of season grocery store strawberries can taste like the fresh from the berry patch sun ripened strawberries of May. It is strawberry berry season around here right now after all so, if you are a purest fresh cut strawberries are equally delicious in this dessert. Butter and flour a tube pan and set aside. In a mixing bowl combine flour, baking powder and salt and set aside. Combine butter, crisco, and sugar in the bowl of a stand mixer. Mix until fully combined, light and fluffy. Beat in eggs one at a time. Then, continue to beat until the mixture has lightened and increased in volume. (at least one full minute) Add in flour mixture and mix until just combined. Add in milk, vanilla and lemon zest. Add to the prepared pan and place in a cold oven. Set the oven to 325 degrees F and bake for 1 hour and 15 minutes. Let the cake cool completely before slicing. Cut off the stems and slice the strawberries into thick slices. add them to a cookie sheet lined with parchment paper. Sprinkle the sugar and pour elderflower liquor over the strawberries. Toss to combine. Then, add to a oven and roast for 20-35 minutes. The more ripe the strawberries the less time they will need. Place a medium heat proof bowl over a the top of assuage pan of simmering water. Make sur the bottom of the bowl does not touch the water. Add the egg yolks, 2 tablespoons of sugar and rosé. Whisking constantly cook until the mixture has thickened and coats the back of a spoon. (about 10 minutes) Remove from the heat and using a hand mixer with whisk attachment beat for 2 minutes until cooled. In a sperate bowl, beat the heavy cream and remaining 2 teaspoons of sugar together until soft peaks form. Then, gently fold the cream into the yolk mixture. Cover and chill until use. Can be made up to a day ahead. After your pound cake had completely cool cut into slices. Top with warm strawberries drizzle with syrup and top with chilled sabayon.